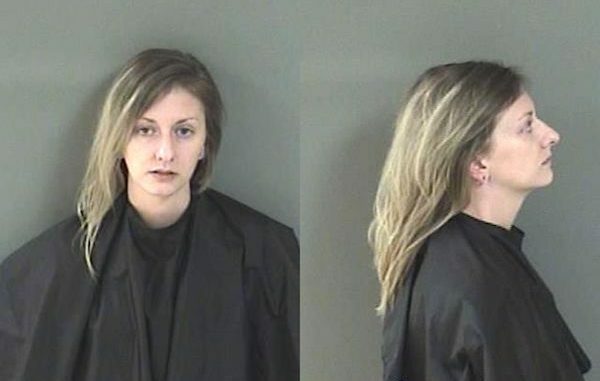 A woman was arrested after striking her boyfriend and punching holes in walls in Sebastian, Florida. SEBASTIAN – A woman was arrested after she allegedly struck her boyfriend, punched holes in walls, and used a hammer to break open a window at a home, according to the Sebastian Police Department. Nicole Balachowski was charged with Battery Domestic Violence Wednesday at approximately 11:20 p.m.
Police were dispatched to the 200 block of Faith Terrace in Sebastian after the boyfriend called law enforcement to report a physical disturbance. The boyfriend said Balachowski was walking down the street carrying a suitcase. Officers located her not far from the residence. “Balachowski had blood on her left hand and had a small abrasion on her left elbow. I asked her what happened and she stated that she had an argument with her boyfriend of two years,” the officer said. Balachowski told police that her boyfriend pushed her out of the home and locked the door. She then broke the glass window of the front door with a hammer and made entry to get her suitcase and fled the home, the affidavit said. She also stated that while her boyfriend was pushing her out of the residence, she struck him with a closed fist and pulled his shirt. Police detected an odor of an alcoholic beverage on Balachowski’s breath, and she admitted she had been drinking that night. The boyfriend told police that Balachowski came home after drinking and was arguing with him. He went to sleep in another room at which time Balachowski started “punching holes in the wall,” the report said. After Balachowski allegedly punched the holes in the wall, the boyfriend forced her out of the front door and locked it, the arrest affidavit said. She then broke the front door window with a hammer she found outside, according to the report. The boyfriend also recorded the incident on his cell phone and showed police the video of Balachowski striking him, the affidavit said. Sebastian Police arrested Balachowski and transported her to the Indian River County Jail. She was released after posting $500 bond.